A war is brewing and perhaps within a few days or weeks, should cooler heads not prevail in the middle east, we will see the opening salvos of World War III. This time it won’t just be a proxy war between various extreme and moderate terrorist organizations. This time, as John Kerry so eloquently noted, the end result may well be war with the Russians. As we publish, Saudi Arabian forces are readying their air force for bombing runs over Syria. According to reports they are also massing ground troops and awaiting the go-ahead from their Western coalition partners, with the final order likely coming directly from the United States. For the moment the United States will be sitting this one out, acting indirectly as more of a support mechanism rather than putting any boots on the ground. Thus, it will be in the hands of the Turks and Saudis for now. But if they think they’re simply going to walk into Syria against battle-hardened forces sponsored by Iran and Russia, they are about to get a very brutal wake-up call. The Saudi forces allegedly deployed are designed for operations to protect the royals. Saudi SF are not trained for foreign engagements, have no familiarity with Syrian, Iranian, or other combat operations. It would be like sending our TSA to fight the Mexican Drug cartels in Monterrey. If the Saudi and GCC SF’s engage in combat inside of Syria without US oversight, they will lose 50% of their forces in the first engagement with Syrian or Hezbollah forces who now have learned how to launch coordinated air and ground assaults on enemy positions. The Saudi military is a joke. Galt backs up his claim with a video that pretty much demolishes the notion that the Saudi Arabian military is trained for this kind of combat. 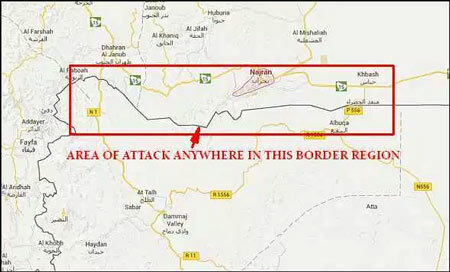 The Saudis have a bigger problem; they don’t even control their Southern border. They are losing tanks, men, and other equipment daily to a bunch of sandal clad Houthi warriors while they have the “best” equipment from the United States. The following is a graphic video of a Houthi attack on a hillside observation post inside of Saudi Arabia somewhere in the Najran Province along the Yemeni border. This war, much like the Syrian “Civil” War is not going according to the desires or wishes of the House of Saud nor the GCC monarchs. It would appear that the regular Saudi and GCC forces are well equipped but poorly trained schleps who are ill-equipped for fighting a rebellion inside their own country or any other nation for that matter. If a bunch of sandal clad Houthi can hit the Saudis like this on a regular basis, and trust me there are hours of these videos on the internet, then how well would they fare against Syrian or Russian regulars inside of Syria? Not very well in this author’s opinion and thus the threat that the Saudi/GCC entry into the Syrian conflict is nothing more than an attempt to draw NATO into a major Middle East war. Article reposted with permission from SHTFPlan, the opinions and views shared do not necessarily reflect the views of Freedom Outpost.